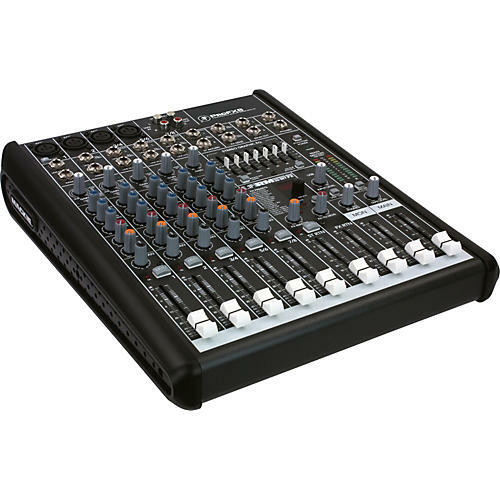 Mackie's 8-channel ProFX8 Compact Mixer with integrated effects is the complete and simple solution for small to mid-size performance venues. 4 Mackie low-noise, high-headroom mic preamps ensure pristine signal while LED dual 7-band graphic EQs, and EQ metering and 60mm faders on each channel keep levels in check. Sweeten the mix using the 3-band active EQ and integrated RMFX 32-bit processor, which offers an arsenal of "Gig-Ready" effects. The mixer easily tunes mains and monitors with 7-band stereo graphic EQ and captures the mix or can stream house music from a laptop using the built-in USB I/O. Protective ABS side panels encase the Mackie ProFX8 mixer's already rugged solid steel chassis. It also includes a free copy of Tracktion 3 Music Production Software. Tracktion 3 Music Production Software doesn't make you bounce around endless menus and windows to make music. Based on a simple, single-screen interface, the award-winning Tracktion 3 is a fast, powerful, and complete solution for turning your ideas into finished songs. It comes a plethora of power and plug-ins to keep your music flowing-not locked in menus or limitations.